Green Writers Press, 9780998260426, 216pp. Maine is a talisman of the American imagination, offering beauty and wildlife to tourists and natives. 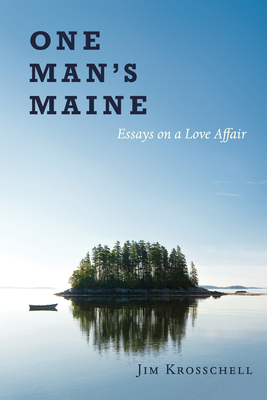 Over the last few years, Jim has published many essays about the wonders and challenges of Maine’s environment, and One Man’s Maine collects and edits them into sixteen pairs. The first essays of each pair employ the natural icons of Maine—lobster, moose, blueberries, lupine—to reach into matters of human significance. These are familiar essays that combine science and belief, observation and emotion. The second essays are broader and more discursive and take on a fuller range of experiences in this beloved state. Jim Krosschell has been supporting the Maine Turnpike for 30 years. After a career in science publishing in the Boston area, he began to spend more time in Maine and writing much more regularly. More than 50 journals and magazines have published his personal essays, most about Maine, and his book Owls Head Revisited was published in 2015 by North Country Press. He is also president of the Board of Directors, Coastal Mountains Land Trust, in Camden, Maine.